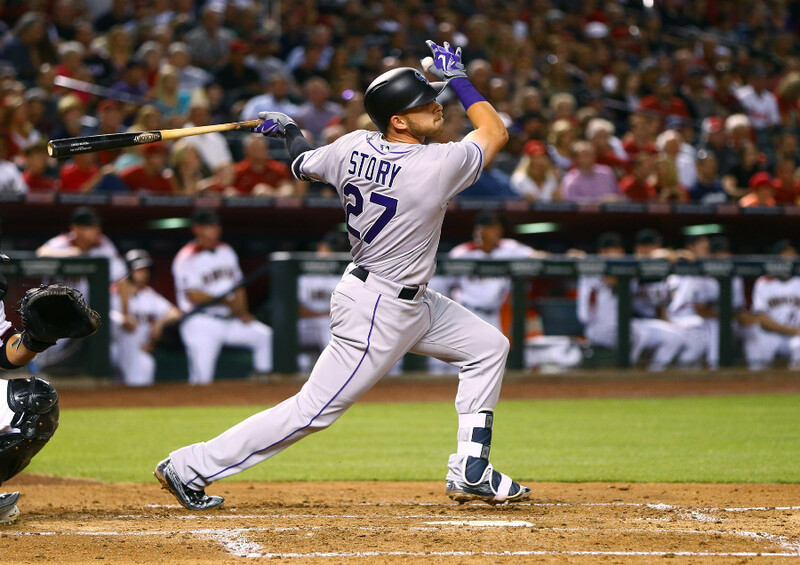 Colorado Rockies shortstop, Trevor Story, made his Major League debut Monday night, and the rookie has already penciled his name in the history books. After grounding out in his first at bat, Story took it to Zack Greinke, one of the game’s best, in the second plate appearance of his career. Story loaded, swung and watched the ball fly off his bat. The ball carried to the opposite field, and just like that, Story has his first major league hit, RBI and homerun, all in one at swing. If that had been it, if Story had struck out the rest of the night, it still would have been a historic debut. But that’s not how Trevor Story does it. His next at bat, Story stepped into the batter’s box and Greinke came set. The first pitch pitch goes by. Ball one. The two repeat their motions and the second pitch comes by. Ball two. The two once again come set and the pitch comes. Story gets a pitch he can handle and absolutely scorches the third pitch of the at bat. The ball is no doubter off the bat of Story that cruises over the wall in left field for the second homerun of the game for the rookie. That second homerun made history, as Story became the first player to ever hit two home runs in his Major League debut on Opening Day. So, in his first day as a pro, Story already has put his name in the history book. Story is the shortstop of the future for the Colorado Rockies. He’s the first player not named Troy Tulowitzki to get the opening-day nod at shortstop since 2006, and that means something. Story is now one of five players since 1913 to hit two or more homeruns in their debut. Story has made an impact on the Rockies already, so hopefully he can continue his impressive play to truly help solidify the left side of the infield and middle of the lineup for the Rox.